It’s truly God's Own Country down in Kerala! Today's guest post is by travel blogger Shalini Baisiwala and her experiences traveling alone in Kerala. Over to Shalini. In March 2017 I planned a Birthday getaway trip to God’s own country- Kerala for two reasons. 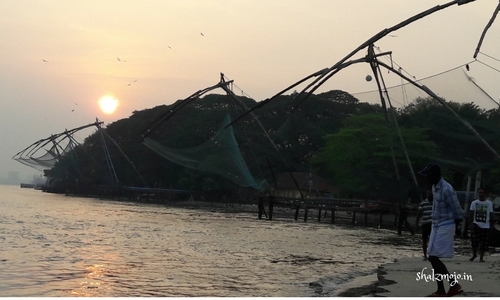 2) I simply love Kerala for its cuisine, natural beauty and cleanliness. I have earlier tripped across the Northern part of Kerala and this was my first time in its southern region – but I must say it felt the same when it came to people, culture, food and the organised manner of things set up all around. Fort Kochi is quite a vibrant seaside town with a great buzz in the air, thanks to the Biennale that attracted folks from all over. What amazed me was the seamless management of an event of this scale, handling the influx of tourists and yet the city was calm, clean and organised. I guess I will harp on the Biennale in another post and will just tell you about all the amazing things I saw, did, and ate and the folks I met in this beautiful state of Kerala. The Fort Kochi beach is quite clean and it’s quite an ordinary thing to see dolphins frolicking in the sea – yup you read that right! I couldn’t get enough of watching these gorgeous sea creatures leap around and was up at the crack of dawn on almost every day to spy on them. The local fishermen were a friendly bunch and helped me up on the gigantic contraption which is the famous Chinese fishing nets. One gentleman proceeded to enlighten me with gusto about the history and working of them. Cleanliness is a way of life in Kerala and I was delighted to see clean streets with no garbage mounds or stench of any kinds as I roamed the streets daily. The shops and road side stalls are stacked up neatly with no filth lying around. I loved these cookie jars in most baker shops – just see how beautifully they have been arranged. 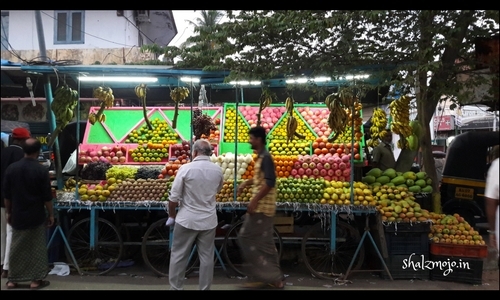 Same is the case with the fruit and vegetable stalls. And this was the case in most shops that I saw around. 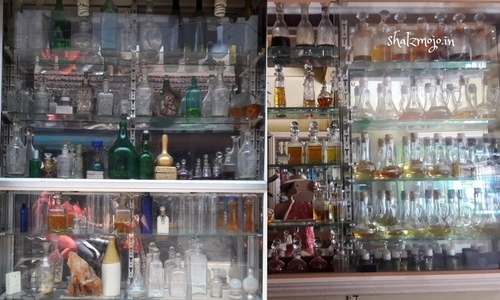 While walking down one alley, this shop window with its array of glass bottles caught my fancy. Stepping in, I realised it’s a perfumery. 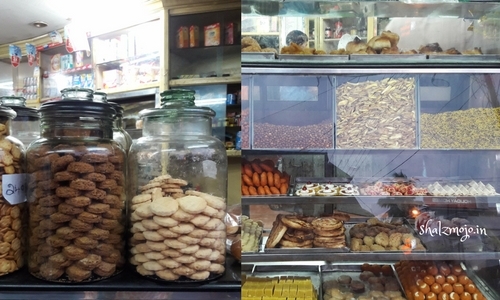 The smells emanating from this shop were just mind blowing. I got chatting with the proprietor who delighted in making me sniff out some delish vapours and proceeded to explain the fragrance notes in them and what they would be best combined with. I ended up buying quite a few vials of rub-ons and spritzers from him which are still being used by me! Another street was full of bags of spices; some that I have never seen or heard of in my life. I had to then start pestering the shopkeepers to enlighten me on all of them. I couldn’t stop clicking them either. One such person directed me to a women’s co-op that sold them at a much reasonable price and boy did I have fun shopping there. I have been gifting them to all and sundry as I did manage to buy quite a lot of it. 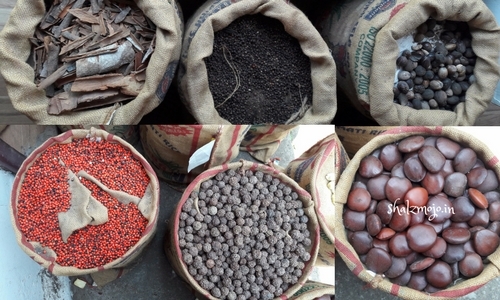 Nutmegs, cinnamon, mace, peppercorns, dates, jaggery – you name it and I got it all! I travelled in the local buses and ferry to get around as I feel that’s the best way to imbue the local flavour. I met such nice and friendly folks on these rides. What was amazing was the way men occupied only the last 2-3 rows of the buses, leaving the rest for the women who by the way are out in droves in Kerala. Even if there were empty seats, men preferred to stand – I cannot imagine this in Delhi. What an amazing culture this place has. In fact most folks I met greeted me with a smile and if I initiated a conversation, they were not shy or reluctant to talk to me. I got chatting with a young girl of 24 who turned out to be an electrical engineer. 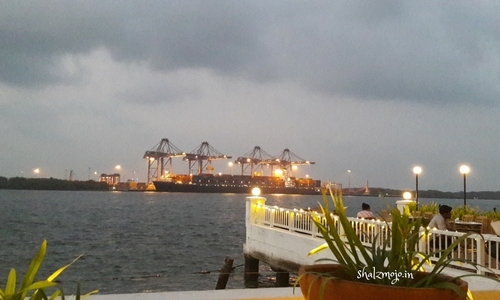 When I asked her what work she did, she pointed out to these huge container cranes that are always working on the harbour and said she along with a crew of 5-6 ensures they run without any hassle. Oh Womaniya! !You made my day – my India certainly has progressed way more than I could have ever imagined and I felt so proud of that girl who blushed when I complimented her on her feat and shrugged it off as an everyday thing. I don’t think I will ever forget her. Eating out alone in restaurants (road side or fine dining) was so pleasant with amazing service (read attention) from the servers and management alike. I lazed at each mealtime and there was no push from the waiters to vacate the table despite people waiting. No one rushed me to place orders and I could just sit for hours. Needless to say the food was amazing and yes I tried out the local flavours mostly. I happened to take a water tour of the Kochi Heritage trail and loved the folks in that tour who without any hesitation took me under their wing since I was the only non-Malayalam speaking there. They prompted the guide to attend to me first, decoded out each dish at the lunch ensuring I had 2-3 helpings and made me feel like one of their own. Turned out they were from the department of archaeology, the head is a woman who was so motherly to me and invited me to come visit her at her office and take a tour of it too. I did do that and she loaded me with so many gorgeous books and catalogues on art that I was just rendered speechless. There are such nice human beings in the world, most are found in Kerala. I met several solo women travellers on this trip, each was happy to bond and spend some time together in a café; yes I made loads of friends on this trip. What amazed me was the ease with which I could travel on my own in India – a country notorious to be unsafe for women. Maybe it was the thing about being in God’s own country that made it so. I was delighted to note how well educated the people in Kerala are and how much pride they take in their country. As a tourist I was thrilled to bits with the infrastructure, cleanliness and ease of travel in this land. I would recommend a trip to Kerala to be undertaken at least once in lifetime and I can't wait to be back here as there is still loads for me to explore. You can also check out my guest post at Shalini's site about the airports I consider the best in India and those that could use some improvement. Amazing post. Loved reading it. Thank you so much- its been a delight for me to travel there both times and I cant wait to plan another trip soon! 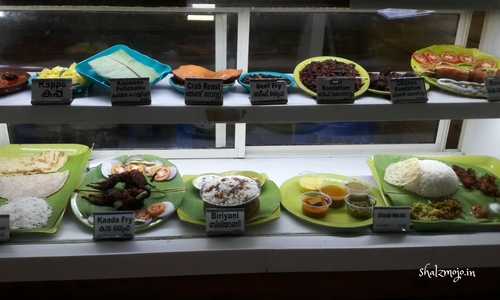 Kerala is one of those exotic destinations which lots of Americans enjoy in India..the white community usually is impressed by the simple food culture on banana leaf. I have heard lot of stories about Kerala .. its cleanliness ,freshness ,food and scenic beauty .. may be next trip to Kerala as vacation. No tjust Americans but most foreigners I met on this trip were equally charmed! You must definitely try and travel there - Munnar and Wayanad are two other really popular destinations of Kerala and very very scenic! A lovely travel indeed there Shalini!!! Kerala with its is pristine beaches and back waters is an expereince of a kind.Plan a visit around Onam sometime and you would see the vibrance of the entire state. I agree... Onam would be a riot of colours. It was a lovely description, was it not? Touchwood... I feel the same way. Nicely written blog on Kerala trip. I have been to that state couple of times. But then it always feels like something is missed out. Would want you to go back again. Thanks so much Nameesh! This was my second trip and I cant wait to make more there - truly loved being there!! Hey Bushra its been one of my safest travels and I have felt so liberated and free here! You must check it out for sure!!! Fort Kochi beach is on my to do list .The trip sounds amazing .Would love to travel to Kerala.Shalini has penned a beautiful travelogue.I want to see those Dolphins! Loved this post. I am yet to travel to Kerala and this has encouraged me. I loved the pics of delicious food. Thanks Hiral that feels good to know; I am glad to inspire your next travel! We have covered Kerala in last 2 years and agree with Shalini. It's a beautiful place and worth a visit. I have friends who have shifted to kerala this year and now checking this post i am soon planning a long vacation to kerala!!! Glad that the post found its mark with you and hope you have a lovely vacay in Kerala soonest!